... These are fantastic places to find gold. They are also the best places to start your gold prospecting and metal detecting search patterns. Old gold miners, early metal detector operators and even the new hordes of metal detector operators using Minelab 4500 machines wont get all either!!! Insufficient Water to process gold bearing soil. They couldn't see underground like you can with a metal detector. Simply didn't walk over the gold. Here is a few sources where you can get information about old gold mines and gold fields and use it in your armoury of gold prospecting research tools to win plenty of gold. 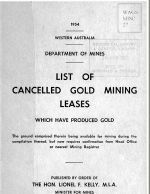 1954 Book listing of cancelled old Gold Mines which have produced gold. NOW...You can have your very own CD copy or download a PDF copy See next entry. Locate over 34000 Mines and their GPS Locality. Extract GPS points Ozi Explorer ready and for Export to Google Earth. Historical Gold Mines Listing CD or PDF. OR Download this free Ebook showing how to Find Old Gold Mines Using Tengraph Online here. ....OR Download this free Instruction book which is the Goldmine Finder - Instruction Book and it will describe the power of this tool in your armoury. Gold Books and old mining publications from the Department of Mines and Petroleum. OR Specifically to find Old Abandoned Gold Mines - Download this free Ebook showing how to Find Historical Gold Mines Using Tengraph Online here. Are also available at the Department of Mining and Petroleum Bookshop. More information on where to get free 1:250000 and 1:100000 maps is available at this link about Geological Maps in our website. Advertising of Tenement Approval requests in Newspapers. This happens in WA Newspaper Classifieds generally on Wednesdays. It will give you an idea where there is mining interest and you can use that to look at Geological Maps of the type of geology in the areas of interest. Its pretty expensive to buy all the reports and old books like the excellent "Gold and Ghosts" books by D W; De Havelland and the many information packages provided on gold prospecting. Do you really want to outlay all of that cash and then spend days and days reading it and trying to make sense of it? Do so if you wish, we reckon its part of the challenge to find Gold anyway. We are pulling together Gold Prospecting Location reports based on our research and many years of local knowledge so you can save heaps of time and money but still get all the knowledge you need to find gold in simple, plain english. These simple, easy to use and easy to read reports will provide you with SPECIFIC GPS LOCATIONS AND DATA and Local knowledge insights on how to find gold in each locality in Western Australia. We are currently developing these Gold Prospecting Location reports and will release reports by area on a monthly basis in the near future. If you are interested please sign up to our Gold Prospecting e-News email newsletter below which will announce these reports as they are created - be the first to get them.